Oil separators shall be Rockford Industrial Separators as manufactured by Rockford Separators, Inc., Rockford, Illinois, and as noted on plans. Furnish ____Rockford Model OS-____DW all-welded DOUBLE WALL 1/4" steel separators, ____ g.p.m. 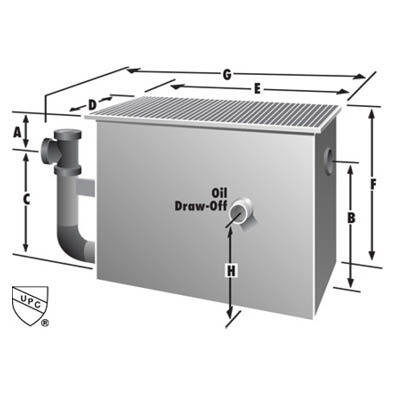 intermittent flow, ____" (tapped) (hubbed) inlet and outlet, ____" tapped internal vent connection, ____" tapped oil draw-off connection for adjustable oil draw-off, visible double-wall outside trap seal, non-removable separator screen with easily removable filter screen, removable 3/8" nonskid diamond tread-plate cover(s) for flush-with-floor installation for pedestrian traffic, or reinforced for ____(light)(heavy) traffic, cover(s) secured with stainless steel flat head screws, extra-heavy leakproof gasket. OPEX® Shop Coat coating (resistant to oil, grease and cutting oils) inside and bituminous coating outside. Anchor flange, filter media, sediment basket, integral extension, epoxy coating, anodes, coalescing pack.